NPD1-GPR37 signaling promotes resolution of inflammatory pain. (A) Biosynthesis of neuroprotectin D1 (NPD1) from dietary docosahexaenoic acid (DHA). (B) Genetic knockout of the NPD1 receptor GPR37 prolongs pain evoked by zymosan injection without altering kinetics of immune cell trafficking or resolution of edema. 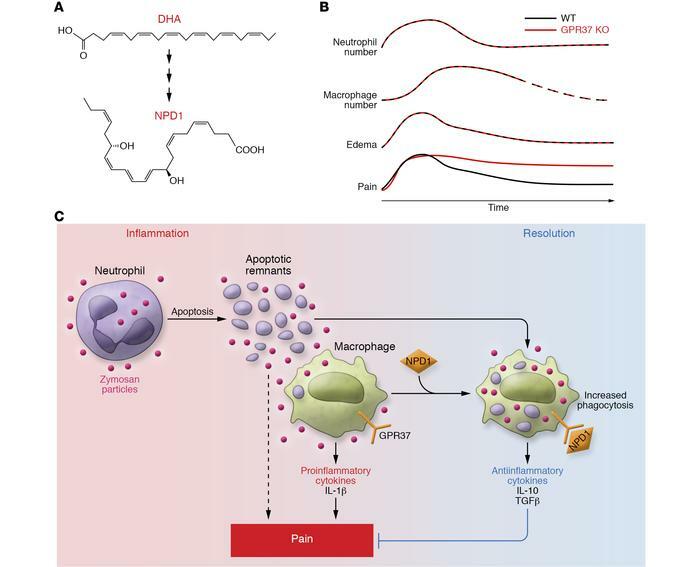 (C) NPD1 and GPR37 signaling likely promotes resolution of inflammatory pain by both enhancing macrophage phagocytosis and shifting cytokine release toward an antiinflammatory profile. Onset of inflammation is at left; resolution phase is at right.